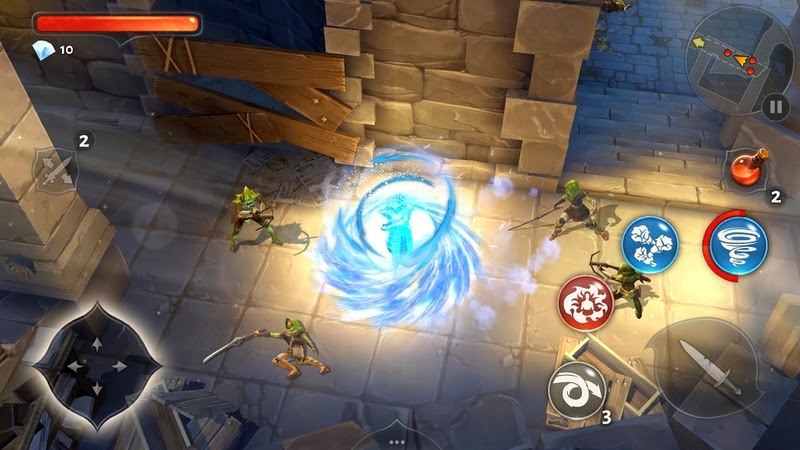 The fifth itineration of Dungeon Hunter has a great storyline and brilliant graphics. While gameplay sticks to the usual fast-paced hack-and-slash action, a new PvP game has been introduced in the latest title. Called Stronghold, this Clash of Clans-like game mode lets you raid other players’ heavily-guarded fortresses and collect loot. Well, Gameloft loves to introduce exciting features to Dungeon Hunter. Their newest game, called Champions, combines MoBA elements with action RPG and provides a satisfying gameplay experience. If you want to know more about this game, read our PvE guide. The newest hack-and-slash RPG boasts several new characters and if you want to know how to get them, check out this article. Players who have played the previous 4 games will be familiar with the gameplay mechanics. For those who don’t know how to play Dungeon Hunter 5 or are finding it difficult to win missions will find these tips and tricks quite handy. There are five different types of weapons in this role-playing game. Each weapon has its own strengths and weaknesses. For example: Dual Blades are quick, but aren’t as powerful as the GreatSword. The latter has its own drawback – It has a slower attack speed than dual blades. 1. GreatSword: Slow, but powerful. May kill most common enemies in one swipe. 2. Staff: Long-range magical weapon. 3. Glaive: Neither too long range nor close range, but quite strong. 4. Crossbows: Quicker ranged weapon. But I prefer melee weapons over ranged because most enemies are too quick. They charge at you without wasting a second. 5. Dual Blades: Quick and close-range. If you can’t complete a mission, then it’s about time you fuse spare/duplicate items with your main weapon/armor to make them stronger. 1. Collect gear. Replay previous missions in Normal, Hard or Expert difficulty modes. Hard and Expert modes need to get unlocked first before you can play them. 2. While replaying a mission on hard or expert mode grants more rewards (such as skills, armor and minions), it’s won’t be easy to finish them. If you aren’t comfortable with the harder difficulty modes, just replay all previous missions in normal mode. You may earn a few items as rewards, but then you will get them without much effort. 3. Once you have cleared all previous missions, go to Inventory > Fusion. You are now ready to fuse spare, unwanted or duplicate items with your all-important weapon or armor to make it stronger. 4. To start the fusion process, tap on your favorite weapon or armor, but before combining items with it, check whether it belongs to the recommended elemental type. Each mission has a recommended element and choosing armor and/or weapon of that element gives you an elemental advantage over your enemies. The “Recommended Element” symbol appears in the “Select Your Gear” screen, which gets displayed soon after you exit the “Mission Details” screen. Note down the “Recommended Element” symbol. 5. Choose the weapon or armor with the same element as shown in the Select your Gear screen. 6. Tap on the plus sign to add items/extra weapons or armor. To get a fusion bonus, try to combine those items that belong to the same element. For example: If the weapon belongs to Fire element, select all fire element items, in case you have them in your inventory. If you don’t have them, just replay previous missions to collect them or use other items. 7. Combining your favorite weapon/armor with other items grants bonus XP. You will need coins to complete the fusion procedure. You can choose a maximum of 4 items and the tap on the green button to complete the fusion procedure. In short, here’s what you should do: Replay previous missions and collect gear, note down the recommended element in the newest mission, go to inventory and select those weapons/armor that belong to the same element. Fuse unneeded items that belong to the same element (you may choose other items also). Note: Before fusing, check what items you have in your inventory. If you don’t have the items of the same element, especially those that the mission’s “recommended element” requires, then you should try fusing any other items with your favorite weapon. 1. Try to clear the newest mission without fail. If you do it, you will earn a first clear bonus, which usually is a set of gems. 2. Don’t forget to take another bounty hunter with you on your mission. Not only he helps you fight enemies, but also lets you earn bounty tickets after winning a level. Earn bounty tickets to open the “Bounty Chest”. Tap on the Chests icon on the top-left corner of your home screen and go to Bounty chest. Don’t forget to collect them via Social > Mail option. 3. Skill items are more powerful than regular gear. You may get them as rewards or loot. There are also chances of earning a skill item via bounty chests. You can equip few skill items at a time. Try not to fuse them with other items, instead make them stronger by fusing unwanted items with them. 4. In the Stronghold game mode, make sure you select a rival bounty hunter whose level is lower than you. This way you can defeat him/her easily in the final showdown, i.e. after eradicating their stronghold defenses. You will earn coins, quartz and league points by raiding other players’ strongholds. 5. Send friend requests to your Dungeon Hunter 5 buddies. If they accept your request, you will earn multiple bounty tickets. Random players let you earn only once. 6. Before taking up solo missions, you will get a chance to recruit a random bounty hunter. Select a hunter whose attack and defense stats are higher than the rest. You may experiment with the selection process, by choosing those with higher defense stats/lower attack rate or the one that shares the same element as your hero. 7. While fighting minions, you can switch to a secondary weapon by tapping on the weapon icon on the left side of the screen. Make sure you have selected your secondary weapon in the “Select Your Gear” screen.